A new line of transportation could be coming to the Maryland Parkway corridor after the RTC voted to improve the city's transit on one of the busiest stretches in the valley. Alicia Pattillo reports, if all goes according to plan and funding is approved, construction for the new bus rapid transit line could begin in 2020. LAS VEGAS (KTNV) — The Regional Transportation Commission decided against building a costly light rail system along the Maryland Parkway corridor. Thursday, the RTC Board of Commissioners voted unanimously for a bus rapid transit system that is going to cost about $345 million, according to the agency. 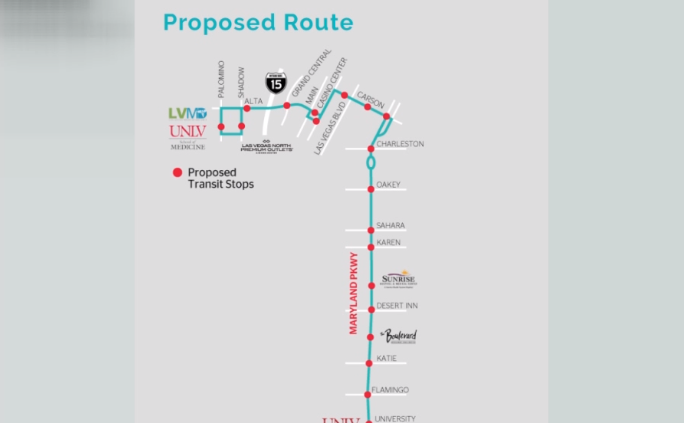 Price was a factor in the decision as the Maryland Parkway route stretches nearly nine miles – starting near McCarran, going past UNLV and ending at the Las Vegas medical district.